sorry I forgot to post that question first time. hello all. very nice informative site you have here. hope it's ok to post ? I've been into analog tape for 40 years. lately I'm buying old gear just to hear it. the Betamax and Betacam format peaked my interest. I lucked into a Betamax w/stereo processor for only $20 USD. 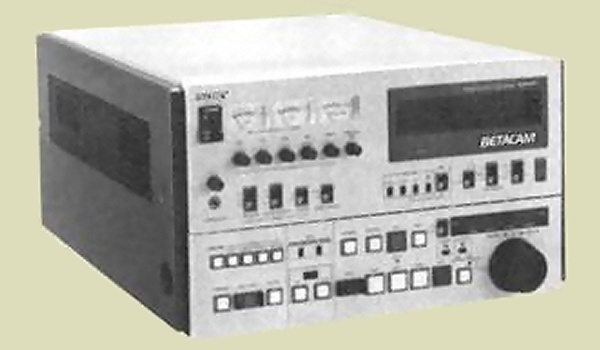 my next experiment will be the early Betacam, the analog machines that use oxide tape, (not the SP and later format). I know these early Betacam machines accept the standard small analog cassette with 30 minutes play time. my question is, will a Betacam BVW-40 also accept a 12" large cassette ?? reason being I have found a small quantity of 12" tapes I'd like to try. if anyone has one of these machines, could you post a reply ? or, measure the depth and width of the tape well, and advise if it's configured to accept the large tape 90min. Error code 01 means that there is tape slack and the machine went into tape protection. Clean the whole threading path and make sure it can complete the cycle. Is there anyone who knows what Error code 01 means on an Ampex CVR-75 (= Sony BVW-75 )? And what to do? I have the following up for sale: 1 AMPEX BETACAM SP CVR-75 Pal Recorder/player, in good working condition, and cosmetically great. With 2 Digital outputs besides all the others, composite, component etc. Bids accepted over 475 GBP. 1 THOMSON TTV-6575 BETACAM SP Pal Recorder/player, in good working condition. With 2 Digital Outputs besides all the others, composite, component etc. Bids accepted over 475 GBP. 1 SONY UVW-1600P, working condition, cosmetically good. Bids over 225 GBP accepted. 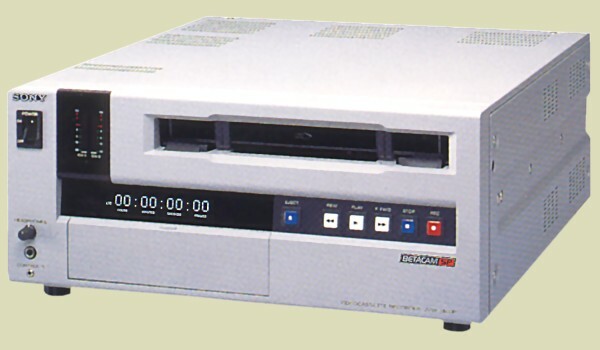 I'm currently looking to buy a Betacam cleaner - something along the lines of a RTI 4100 tape cleaner. Does any one know of anything available. Hello, I have the SONY BVW-35P, is normal that in search and in pause change to B/W? They all power up, but I don't know anything much about them. Happy to travel with decks for testing. Exist some video that record large oxide tapes? It is a familiar problem with the PVW-2800 powersupply. It can be a number of things so it is best to find someone near you to have a look at it. They are getting to that age, I have a few with the same problem. Me and a fellow artist want to "refurbish" an old Betacam SP shot documentary on sung poetry in the Pamir mountains, which is the eastern part of Tajikistan (Central Asia, former Soviet Union). We began the project in 1993 and somewhere in 1995 a programme was ready. Somehow, we always were unhappy about certain parts of the film, so now we decided to act in our private time, before it is too late, tape-wise. Because there is no budget we found some generous people who gave us a PVW-2800P and an AJA-io to be able to digitize the approx. 45 tapes into Final Cut Pro. I suggest that something happened with static electricity or something of the like. All machines were earthed though via the electricity socket. Since I would like to get it to work again I wonder what could have happened and also what I could do to solve it. to kate,what is wrong with tape,is it jammed? They are in Burbank and specialise in 'difficult' tapes. Hi. I have a keeper reel of my work from the late 90's on a Maxell Professional Betacam tape. I sent it, along with other cassettes of work, to a company to dub onto a dvd. They completed all of them except the one tape that had my last bit of network stuff -- some of my latest and best work. The cassette APPEARS pristine. Apparently, it woudln't work. As I said, it looks perfect and the tape has been sitting in a box since the late 90's. The other ones all worked. It's the plate at the bottom of the camera, in between the shoulder pad and rear connections plugs. The short answer to that is no... These are now very much 'vintage' cameras and as such obsolete. Parts would need to be obtained from a scrap unit. By 'back panel' - you surely son't mean the connector panel? Hi peeps, I have recently purchased a Sony UVW-100 eng camera. When it arrived, it was missing the bottom back panel, it's right next to the shoulder pad. Is there a site that supplies parts for these cameras? The old style hours meters will need to be completely replaced when the battery runs out. But you have to ask yourself why you would bother unless you are fitting new heads? The main purpose is to monitor headlife in a professional environment so that machines can be serviced before breaking down. I have more BVW-75P 's than I care to count an none of them have working hours meters, they are still working absolutely fine. Can anyone tell me if its possible to replace the battery supplying the hours meter and if so where it is located. do you have to replace the whole meter unit or is there a battery on one of the boards? Sadly I live in the United Kingdom. Generally speaking you'll find all what you are looking on Ebay. It doesn't show where you live, I have a charger and batteries I could sell but am based in Sydney, postage probably prohibitive. Can you advise me of where to find Batteries, rain covers and viewfinders. The Betacam chatpage is back, unfortunately recent posts have been lost. Description: Electronic Visuals EV-4151 Waveform / Vector Monitor in good condition, sharp beams and no burns on screen. Mains lead included. The EV 4151 is a 6 input waveform monitor which is intended for use in TV and video systems where analogue component signals are present. The inputs are arranged in two groups of 3 component signals though either may be used for composite signals as required. Component signals may be RGB, Y (B-Y) (R-Y), etc... and the unit is compatible with both 625/50 and 525/60 systems. Relative amplitude, timing and signal linearity can be easily established using readily available test signals, eg. colour bars, bowtie, staircase. If you have any doubts about camcorder, you must send me a question and I will try to answer it as soon as possible. As I mentioned above camera comes with a lot of extras. It has two pag chargers. Pag micromaster and Pag Quasar, former is fully automatic charger with power output for camera, cable also is included. Cable is made by me ant not original, but as I worked in studio, I always used this power option to get rid off batteries. Batteries is also included two Paglok Superpacks which are old and not really usable( holds ten minutes or less) and one Paglok L95 battery which is used but holds very good. It also provides information about itself on digital screen. You will know how much it is charged, and then working it also show how long it will last. Next item is Portabrace shoulder case model sc-d600 you can find it on Portabrace webpage. With camera also comes books: Camera operation manual, and two volumes of service manual, so you will be completely equiped with all technical information you will ever need. I provide 4 new Maxel 30minutes length tapes and 26pin ccz cable to output component video. I used it to capture video in real time and didnt use recorder. Cable also is not original and made by me, so no warranty, but it is working perfectly. Everything will be packed in original flight case to ensure maximum safety of the camera. Flight case one side is a little rusty, but still looks and locks good. Tiffen:Black pro � mist �Black pro � mist 2Black pro � mist �Black pro � mist 1Coral �81 EF. Seekinj for a BVW-35p as for parts. Please, only offers from the South-Germany area! I have a number of machines that I am interested in selling if anyone is interested. Please let me know if you are interested in any of the above machines. I don't see a digital PAL page, so I'll try here. Sony DSR 11. DVCam Recorder/Player deck. I bought this new from Prestons in 2005. Its never been loaned or hired out. Operation hours: 9. Drum hours: 4. THAT'S RIGHT, 4!Tape: 3.Thread: 18. The original Sony PSU is here, remote, manual, fire wire,it's all here here, except the little tray Sony give you to stand it on its end in, why, I don't know,plus a box of 10 new tapes. It uses large or small tapes etc.I can deliver to your nearest main line railway station, oryou can collect from WF15 area. A snip at �400.00 This is a test, cash and collect deal, or I can deliver. NO P+P!! Email for more details or call 07722949935 or 01274864826Regards, John. I have problems with a SONY PVW-2650P. Getting errors 01, 02 and 03 for intermittable...and for now only error 05. Some tips? Does somebody have the service/repair manual in pdf or something for this player? SONY DNW A100P Betacam SX. I am looking for a replacement cassette compartment for this machine.If anyone has one for sale please advise. Regards, John. Hello All. I am having a problem with my Betacam Sp uvw-1600, alot like the 1800. I am getting the error code 08-032, which says The abnormal drum speed error is not solved. Is there anything I can do to fix this? Anything I can try? I'm desperately neding to reslove this or at least try everything possible. I know this is a far out cry, I'm thinking the heads are done, but I want to be sure. Thanks in advance for your time and consideration. We provide low cost high quality video tape digitization and metdata addition services. Just send us your tapes and we will send back digital video files as per your needs that you can publish on web or mobile platforms. We will bundle our eLibrary manager, MediaBaron for anyone with 100+ hours of inventory. Check us out at www.movicotech.com . I don't see a DVCam chat page, so I hope this is ok.
Sony DSR 11 DVCam Recorder/Player deck. New Condition.Mileage as follows: Operation 9 X 10 hrs. Drum run 4 X 10 hrs. Tape run 3 X 10 hrs. Threading 18 X 10 hrs.User manual, Service manual, cables, original PSU.Some blemishes, but no dents, digs, or gouges. Fronthinges and panel still intact. I can't find the tray thingSony give you to stand it on/in. Lots of extra goodies included. This is strictly a cash deal. Buyer tests, collects and pays. Huddersfield area. A bargain @ �500.00. Email me for more info.Regards, John. Hey, I'm having trouble with my Betacam UVW-100p. While getting shots on a bus my camera guy turned quickly and stupidly broke off the battery pack at the back, all the clips and threads were broken. He set me up a make shift system using leads. It worked for a short while but has since stopped. I'm afraid he may have reversed polarities. Is anyone aware if this model has a shut off for such an occurrence or are the entire circuits in the camera fried. Tapes as new in cases SP30 and SP60(about 20 in all) London area �15 the lot. Looking for a used DNW-28P or DNW-25P (or NTSC equiv ) at a sensible price ( 1000 Euro or less ). Please email me if you are selling such a unit. Thanks. The Michael Sellman box adds AFM audio channels 3 & 4, which were never a feature on the UVW and PVW series. The box contains an AFM-1 card (used in the BVW-75P ) and necessary cabling to the vtr, to pick up the chroma head rf, and to the modultor for record. 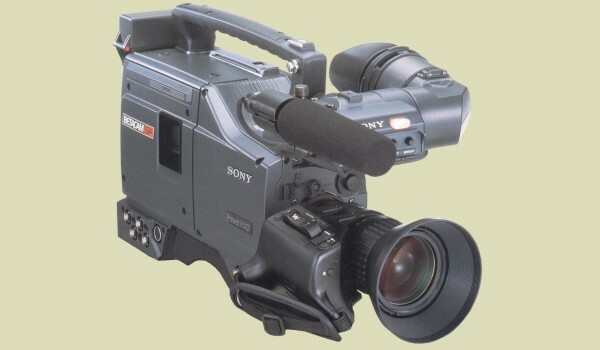 I dont think the vtr itself requires much modification, and i believe some people used to remove the bolt on boxes, as it made the machine look ugly!Sony did make a PCM betacam, the BVW-85P with an add on box PCM-85 (around 1990 i think). The machine had addition PCM heads mounted on the drum. The PCM tracks were recorded in the space occupied by one of the linear tracks. Only about 200 machines were made for the european market and the drums were very expensive, the tolerances much finer, which meant reliabilty and interchange became an issue. I guess with the introduction of digibeta in 1993 and other digital formats, the BVW-85P became obsolete. John,I have never heard of this modification, could it be some sort of PCM interface?How does it connect to the machine? Any chance of posting some pictures somewhere? I am intrigued! I'm new to this, so if anyone can help I would appreciate it.I just bought on Ebay a Sony UVW 1800P VTR. It works fine,but it features a Michael Spellman modification. It has 2 switches, 5 rotary knobs,(2 red,3 white) and 2 analog VU meters. Around the back of the modification are 5 XLR plugs and sockets. This is all fixed on top of the main case. I conclude it is some kind of audiodevice, but I'm not an engineer. It is very well made, looks made for the job. If anyone can tell me what this device is, or where I can get literature brochure, etc.I'm also trying to aquire a User Manual, either PDF or original, for the UVW 1800P. I've tried all the "free manual" sites to no avail. Any suggestions gratefully received. Peter, regarding your post a while back about a 1inch forum. I believe there is a facebook user group for owners of 1inch machines, and also a forum on Yahoo.In my opinion, the 2000s are more reliable, though the air threading is a nice feature on the BVH -3000. Some parts are still available from Sony (like pinch rollers) but are expensive. There is a company in the states that can re-tip upper drums and another (Terrys rubber rollers) that can re-manufacture rubber rollers, like pinch rollers. Heads generally do good hours ( 3000 +) though this is dependant on tape stock itself. In theory, used tapes shouldn't be as abrasive as new tapes, but then there's the sticky shed issue with certain older tapes. In terms of archive, i was under the impression that anything important was dubbed to D2 and D3 (BBC) formats in the mid 90's The problem these days is trying to archive these formats to the file based world we live in now. Trying to fix a D3 digital machine needs a slightly different approach to a 1inch machine-and heads aren't available either! 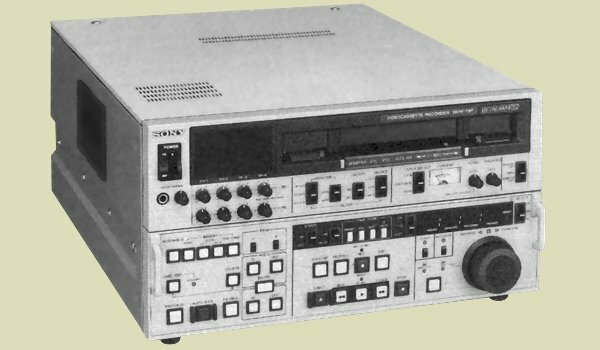 The SL-2000 is a Betamax machine, not Betacam. There are ways to rescue the tape but this will probably require the machine to be taken apart so you can manually unthread and eject the tape.Best to post on the Betamax page, many very helpful people there! Tapes as new in cases SP30 and SP60(about 20 in all) London area �20 the lot. I posted this to the Betamax thread which I think was the wrong place, please excuse a double posting. As you will see I don't know about Betamax/cams, just wanted to help.Whilst surfing the net I came across your site. Having bought the contents of the stores of PSL, an audio/visual hire company I have a number of items that might be of interest to you. For instance a head assembly Sony DBH-42AR A-8260-978-A; Sony part DZR-41-R 8-848-579-03; Sony part DBR-40BR A-8260-975-B; Sony part DBR-40R A-8260-975-A. All seem to be new and some are in sealed boxes. Besides these there are a multitude of other bits and pieces, I can e-mail a list if anyone is interested. They are of no use to me and I will be happy to take any offers. 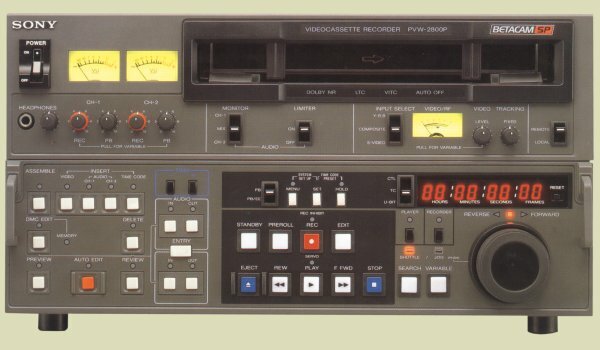 I'm selling a PVW-2800P recorder in perfect condition (used a very few hours).Make me a reasonnable offer. I'm in France. Sony DCX-537 head that I need help with. It powers on but the output to a monitor and the viewfinder is not correct. On a monitor the screen is light blue at the top 1/8th and light green on the rest of the screen. Even pointing it at a bright light it does not change. Also when bars is switched on it shows the bars but is very dark and no blue or green showing. Maybe bad caps? HELP! Electronic Visuals EV-4151 Waveform / Vector Monitor Good Condition, sharp beams and no burns on screen. Mains lead included. The waveforms can be displayed as single or parade in both line and field timing. The EV4151 is a six-input waveform monitor intended for use in TV and video systems where analogue component signals are present. The inputs are arranged in two groups of three for use with two sets of component signals though either may be used for composite signals if required. Frank, check/swap your DM-56 and TBC-7 boards, as you may have a bad filter on them. My BVW-65 seems to have lost its brightness channel. This appears to be true for both component and composite outputs. So far I have inspected the caps in the unit which show no visible leakage, pulled and reseated all readily accessible boards and opened the back panel and inspected (and jiggled) all wiring. The video controls have been tried on both preset and manually adjusted. The video head has been cleaned. The monitor has been checked to be sure it is OK. Unfortunately, I have no maintenance manual for the BVw-65 or BVW-75. Can anyone out there point me in the direction of a likely cause/solution and/or related maintenance information? Thanks for any help. LOOKING FOR WANTED LOOKING FOR WANTED. Hi Does any one have a AJD 350 machine available. If you have one and would like to sell it, please let me know. SONY DVW 250P FOR SALE, Fully serviced, fully operational. Call for details if you are interested. I have inherited some NEC Betamax stufff and want to see if I can get it going. I have a video camera, a video thing that plugs in to the camera and also what looks like an actual recorder as well which I presume you playback the film? I was hoping to get some help on how to test it/set it up and also I have been unable to find a single article on the NEC equipment I have? I have purchased a BVW-40p, and was testing it on a sony monitor using the composite output. All was well for ten minutes until I lost the output . The video VU meter does not move either.Has anybody got any idea what has happened here. Any help would be appreciated. FOR SALE: BETA CAM w/Case, Tapes, 4 battery paks. Mint Condition. "Beta Movie Pro".Location: San Diego, California, USA. PLEASE LET ME KNOW IF YOU HAVE A SONY J3-A AVAILABLE FOR SALE. BVM D24E1WE SONY HD MONITOR FOR SALE. Includes BKM 21 SD CARD, BKM 41D HD CARD, BKM 10 REMOTE CONTROL.Slight mark on screen, �7,500.00 GBP Excellent price ! I presently have hundreds of Digital S tapes as well as quite a lot of Betacam and Betacam SP tapes - all of which have been used at least once and probably no more than that. I WILL offer you the best price available so please phone me to discuss on 07792 688 603 (Scott).I am based in Bristol so you will have to collect from here.All the best. Sony Betacam tapes in hard cases. Some used but all in excellent condition. Large size (60 min) �5 each. Discount for bulk purchase. Email for details. London area. Betacam SP UVW-1800P (PAL) for sale. Very good condition. Serviced by BBC Machine Group in 2005, with little use since, so still in excellent working condition. Takes small and large tapes. Plays and Records. Comes with BNC, XLR, and power cables. Email [email protected] with (sensible) offers. [Hours Meter reads: Drum 0038, Tape 0018, Thread 0155, Oper. 02835]. I hope that this is of interest to your members.Thanks, David. For Sale - Sony UVW-1800P (PAL) Good condition with manual and mains lead. Operation 1102 x 10 Drum 0254 x 10 Tape 0123 x 10 Thread 0675 x 10 Beautiful results in recording and play back.